Barringtonia calyptrata - The Mango Pine or Cassowary Pine. From tropical North Queensland, Barringtonia calyptrata is an attractive flowering tree commonly called the Mango Pine or Cassowary Pine. 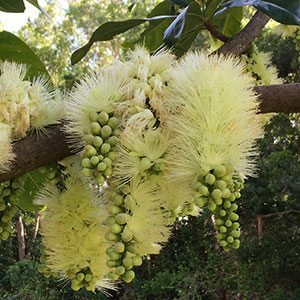 Flowering in spring, this is a semi deciduous tree in cooler climates, closer to evergreen in true tropical areas. In recent years it has found its way as a street tree, which good foliage and beautiful flower it deserves wider recognition in the landscaping industry. The flowers appear in large clusters, creamy white and fragrant. The flowers are very attractive to bees and nectar seeking insects and birds.The foliage is glossy, alternate and whorled. The flowers are followed by a blue fruit which are very attractive for the native Cassowary, hence one of the common names. These fruit small a little like mango, hence one of the other common names. In cultivation use this as an ornamental shade tree. Plant is a humus rich well drained soil. Common Names – Mango Pine, Cassowary Pine. Height – Can reach 10 metres, usually smaller in cultivation. Spread – Will form a crown to 5 metres across. Foliage – Glossy and alternate. Evergreen to semi deciduous depending on climate. Fruit – Blue and oval in shape. Barringtonia calyptrata is available for sale from the following nurseries.